I have been doing this wrong for, um, a while. Note to self: when we make fajitas, that is to say, when Lauren makes fajitas, remember to put the sour cream on first, so that you don’t just end up with two big globs of sour cream on yours. I don’t really remember when I had my first fajita. I would say it was in college. 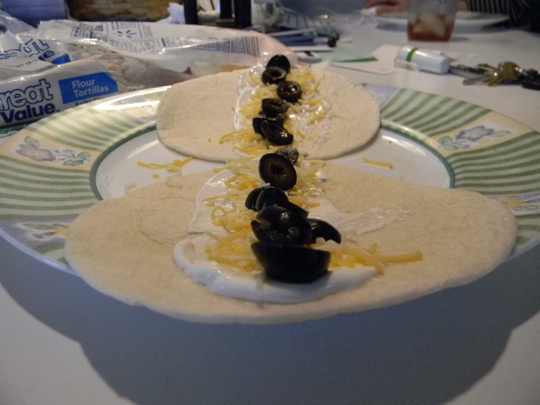 Also note: you might be better off just throwing another tortilla on top and calling it a sandwich. That is a great idea. It seems so obvious, yet I’m completely surprised by it. When I roll fajitas, I first fold the end up, then roll them. That way, the insides stay in better. But it uses up some of the tortilla, so I can’t get as much stuff in. I don’t use sour cream, so I don’t really get what you’re saying. I only use chicken or steak, onions & peppers and of course salt & pepper. And I could do without the actually fijata as well. Is there meat on this fajita? Yes, there’s some chicken under the onions and peppers. It’s scared. 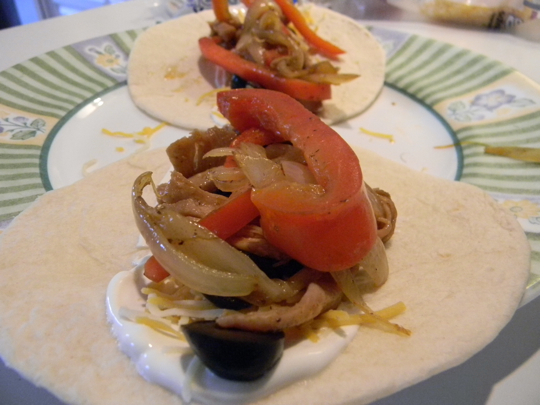 Fajita sandwich, Lloyd had one in Texas so we have to make them every once on a while. Cassidias(probably spelled wrong). Sure looks good.